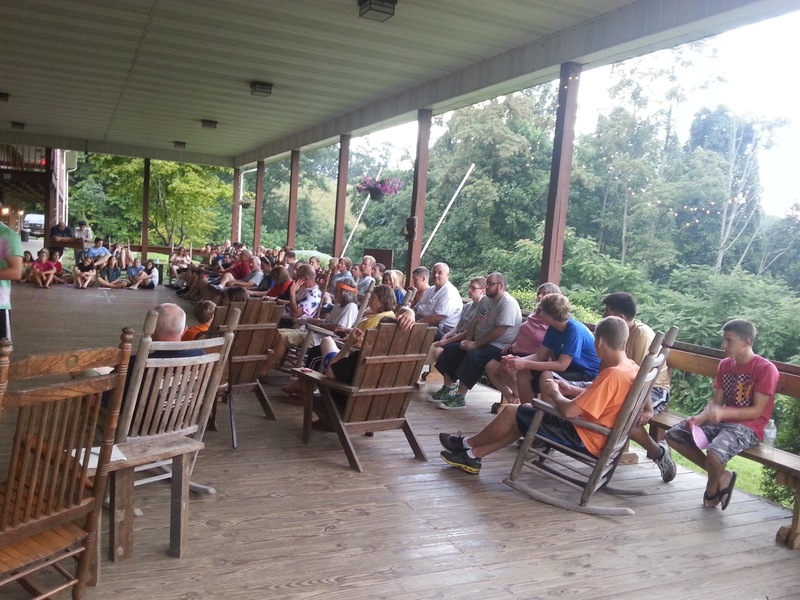 News and information for and about Appalachia Service Project (ASP) volunteers from The Presbyterian Church at Bound Brook (New Jersey) and its surrounding communities. Today we worked on our 2nd site with Chris's crew. On our first site, we replaced the bathroom floor and put new laminate floors down in the laundry room. We really made a connection with the little girl Zoe Beth and her adorable cat named Kitty. On breaks, we would often play with both of them and created a strong bond between us. On our second site, there is also another adorable girl named Becky. Making connections and building relationships with the family is one of our favorite parts of ASP. Today was a longer day and we got a lot of work done. We worked on the foundation of the house. In order to support the house, we needed to dig fifteen oles and put 6x6's in them. We then secured the wood using concrete. Overall even though it was a long and tiring day, we had a lot of fun. -Becky. Note that the Magic Kingdom hails the following constituents: Keith B., Lee G., Carsten B., Tyler S., Will E., Becky C., Rachel S.
John Almendinger and Stacy Brenes reflect on what brought them to ASP and what keeps them coming back. ASP has changed me very much. Seeing the conditions that these people were living in really makes you realize how good you have things. While at Little House, we needed to take off and replace tin on an extremely steep roof. We also needed to demolish a chimney. Everything on this roof was dangerous. The tin could come off with a little bit of rain and the chimney we took down by picking pieces apart. This is not safe for a family of four. Putting on the new tin felt just as good as taking it apart. it felt good because I knew that the family will be safer and drier for a very long time. That chimney will no longer be a hazard. Because of ASP, this family will soon be living in a house that is not dangerous and they will be warmer, safer and much drier. Note: the Little House work crew consists of: Doug F., Joe D., Doug O., Lee G., Nick B., John A., Jamie O., Jenna D., Sarah E.
Our crew consists of Ryan F., Laura G., Dave H., Jeff G., Kevin S., Matt D., and Heather A. Our job sites name is called The King. We had no idea shy until we walked into our homeowner's Don's house. He has everything you can think of in the form of Elvis! Don is pretty quiet, but is one of the nicest guys in Virginia. This week we were given the task to "gently remove" his old tin roof, add underlayment, then install a new tin roof. The week thus far has been pretty eventful. the first day was the day of the bee! We removed all the tin and started to lay the underlayment, then the bees came. Dave, Kevin and Ryan were casualties to the bumble bees! The second day we continued to add underlayment. This made it pretty tricky to navigate the roof, but we managed! There are a few hols in the roof that made a few people slip, thankfully we have a talented experienced roofing crew. Today we had a little bit of misfortune with the rain. We had just started tinning when the lightning came. Our house leaked a little, but Don said The King has been through worse! We plan on finishing the whole roof by Friday. Don can't wait to see it finished and neither can we! Greetings everyone! Danika and the Contructacons here! We've had a very busy week so far and quite a bit to share. This year, our group (Andy b., Rich e., Kelsey S., Liam N.,, Timmy G., Matt S. and myself (Danika NY.) were assigned two homes to work on. We started and Don's house, where we gently removed rotting wood from the underside of his porch roof and replaced it with plastic sheeting. The first day on site, we didn't really see Don, because he stayed inside until after lunch and sat on his front porch while we worked in back. All he really told us was that he'd have venison jerky for us the next day. Tuesday came and we began painting the seething and building a book shelf for Don's porch. His friend Toni had come over and both men came out to join us for lunch (as well as Don's cat, Huckleberry.) Our crew munched on PB&J, chips and venison jerky as Tom entertained us with stories of his younger days. Then Don spoke. He said he had something he wanted us to hear. I could tell he really wanted us to listen to what he was about to say so I looked up as he began his piece. make the difference that only your can make? ...Say yes"
We were all speechless. Don told us that it was a piece of prose he had heard years ago and now carried in his heart. That moment of sharing make ASP worth it for our crew. I later asked Don to repeat what he had said, "If you promise to share it, I'll give your my copy", and he did. And now here I am, sharing this beautiful message with all fo you at home, because I feel it speaks perfectly to what ASP is all about whether you travel out of state or support from home, please always remember to "say yes." Over the past 3 days, our group has become real close to our "eccentric" grandma. She is a wonderful person who is in touch with her comical side. she refers to herself as "Rambo." She has a passion to protect us from the snakes and spiders, even telling us stories on how she kills them. This eases our fear of the poison snakes and spiders. Now our project has to add a floor to her closet, paint her shelves and add support to the foundation. "Rambo" screamed in joy as we worked hard to accomplish these tasks. This being my first year, I have truly seen the hardships of this area. As for Nicholas, he has once again loved helping others in need. As a group we have striven to make "Rambo's" life better. . . even in the pouring down rain. While we still have a few more days on the site we have already accomplished a lot. Our work crew "The Jungle" has been met with a series of challenges and surprises at the beginning of the week. We were told that we had to fix the foundation of a house and finish a drainage ditch that was "supposed" to already be a foot wide and 18 inches deep. When we arrived on Monday morning that was not the case. The drainage trench was barely 3 inches deep. So most of Monday consisted of finishing that. Our first set back. When checking out the foundation problem we realized it was a lot more difficult than we were told. Fixing a foundation really meant saving this woman's house from collapsing any second without injuring any crew members. Set back number 2. Our fearless leader Chris had to work extremely hard to figure out a plan that kept everyone and the house safe, which was not an easy task. But we knew he could do it and sure enough Tuesday night we had a plan and a little spark of hope that this seemingly impossible job could be done. Come Wednesday morning we began constructing the structures that would hold (or not) the house. Once we had enough build we put the first one in and started to jack up the house. Little by little the house lifted and was being held by hour newly built structures. It worked! After what seemed like hours jacking up the house everyone's heart could finally beat at a regular pace knowing we did it. We could only celebrate for a minute or so because there was a lot of work left to be done and only seven of us. There had been rumors that we might be getting another crew to help us but it wasn't definite so until then we just had to keep truckin' on. We took a break for lunch and stopped back at the center for a much needed bathroom break and when we arrived back at our site there was another crew waiting for us. It was an unbelievable feeling knowing we had more hands to help and that our job could really be completed. Those two set backs in the beginning weren't even relevant to us now, and that little spark of hope transformed into reality. The second part of the week will not be easy and we will have to overcome more challenges but we'll get through them whatever it takes just like in the beginning of the week. That's the thing about ASP and our church family when someone is struggling there are many people who are ready to help out. That's the true joy of ASP. Note: The Jungle team consists of Chris A., Melissa B., Kyle B., Andy G., Zach B., Mary H., Kira B. In 2012 the greatest discovery since sliced bread was found in Warfield, Kentucky. The diamond in the rough was found on the ASP trip in a 25 cent soda machine. It was the ultimate drink, Faygo Peach Soda." When we left we had bought every can we could find. To your horror we discovered that this nectar of the gods was not available in New Jersey! So the search began. With no luck, we were found to be "Faygo Less!" As we prepared for this year's trip, the though of restocking our stash was in our minds. Once again to our horror we found no Faygo when we arrived here in Jonesville. A substitute needed to be found to quench our ravenous thirst. To our good fortune we found 2 worthy candidates: "Walmart's" no brand and Peach NEHI. They were worthy substitutes but Faygo was still in our hearths and taste buds. To our great fortune we unearthed "6 rare bottles of the amazing and "DEE-LISHUS" Faygo. Now we had to prove that Faygo was truly the best of the best. So what do we do? A taste test was the only solution. On the evening of July 9, 2013 a fourth candidate emerged. It was the dark hour "Best Choice Peach Soda." The battle was about to begin. With 2 completely impartial judges who were the only ones to know the true line-up, we could begin. Up to 7 testers were assembled when the smoke cleared Faygo stood alone. Walmart and NEHI battled well while Best Choice, just stunk. There was elation and some sadness in the outcome. We're happy that Faygo is now proven to be king, but now we're back to trying to find more to bring home. I guess that's the way life works. P.S. Stay tuned for the greatest soda challenge know to man. Faygo takes on all comers on this planet and any other!!!! Our job is to gently remove a front porch and replace it with a new one. We are also assigned to finish a floor in their house as well as put the finishing touches on the ceiling. Jack, Jon and Chelsea gently deconstructed the old porch and almost finished rebuilding the new porch by the second day. Erin and Kaelin have completed the wood floor and painted the ceiling also in the two day period. Kathleen and Laura played with the young children of our family. Kathleen and Austen, who is 4 years old collected crickets and other bugs. Laura taught Desiree to pump on a swing and chased her around the house trying to keep her out of the work zone and out of the hair of our family's mother Rachel. She has recently been troubled by back issues and is an extreme amount of pain. Our group has also had the pleasure to meet Rachel's parents, who visited and took the whole family to their house up the road so the children could go swimming and Rachel could rest. Marlin, Rachel's brother has been to the house helping Rachel with caring for her family and helping our group as well. This experience has been amazing so far. Our family has been great, the children are absolutely adorable, the dogs on our site are cute as ever, and we are getting so much work done in just two days. Each year is different, but there is something about this year that I can't put into words. On the end of the day on Monday night, I was happier than ever. Everything was falling into place and I was so excited. I always look forward to ASP, and there are a lot of changes this year but I have had a smile on my face ever since we left Saturday morning. We are all like a family here, and it feels great to have so many people that are all here because we love what we come here to do. It really is a life changing experience. 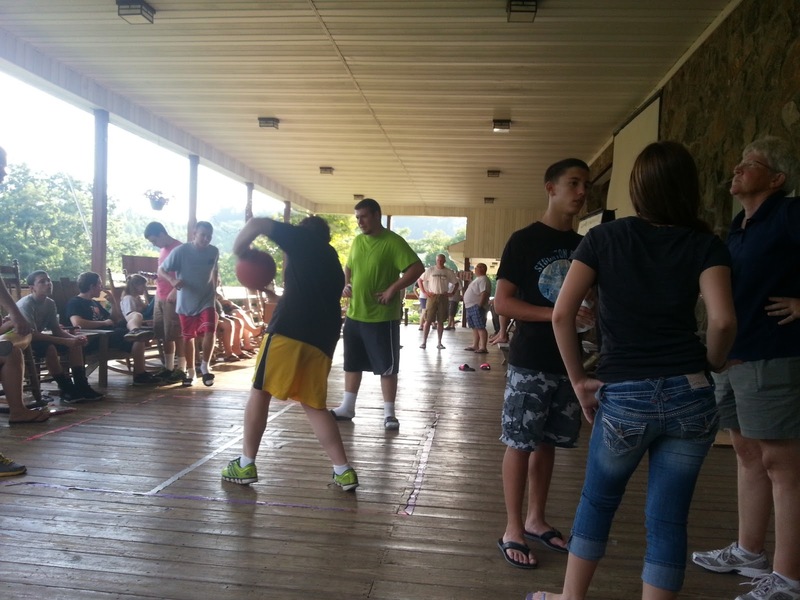 This will be my sixth year coming on ASP and it has changed me as a person. There is no better feeling than knowing you are making a difference in somebody else's life. We had our prayer walk today and I also try to reflect on not just what I'm doing, but my life as a whole. I came with a smile on my face, and it has not gone away. I'm ending this with love and a hug because my reflection today really made me appreciate life and what we are here doing. I haven't sat down and thought about a lot of things for a long time, but getting a chance to walk around every station made me open my eyes even more to what I am grateful for. I am here for a reason, and I'm thankful for the opportunity. In two days, I've gotten to get a glimpse of the relationship between our humanity and God. My crew is working on a roof, a bathroom and a porch. 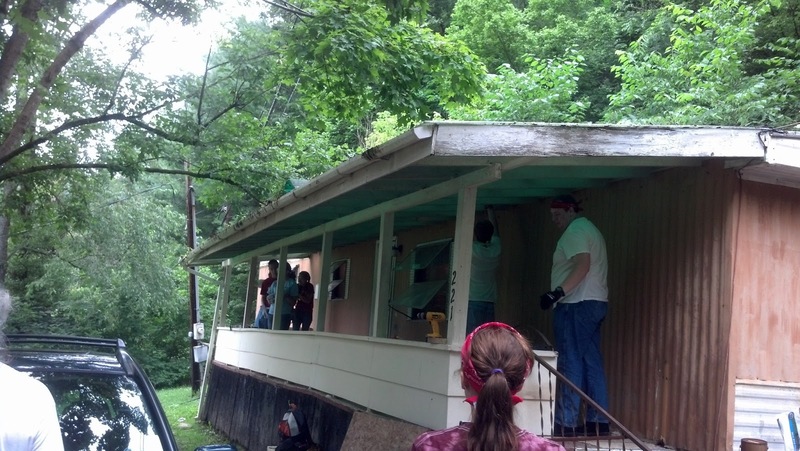 On the first day a couple of us began to "gently remove" the porch in order to rebuild a new one. In the midst of the debris, I realized that we are like the porch that we are working on. Some time ago, the porch was built shiny and new on a sturdy foundation; yet years of storms, floods and use allowed for the porch to become weak. Water seeped into the ground and caused it to slide; it seeped into the crevices of the wood and caused it to rot; it rusted the nails and made the gutters fill with grime. After years of neglect the porch was no longer the strong, sturdy porch that the carpenter had once made. our homeowner saw this, he added a porch swing, decorations, and laid a new board to lay atop of the rotten ones and though the porch looked better, the rot, rust and grime still lay beneath all of the superficial changes. As we tore through it I realized how we are a reflection of this porch. God created us, strong and with purpose; yet sins, tribulations and neglect of our spirit and faith leave our souls, hearts and minds in the same position that the porch is in. Some of us try to cover our sins, we mask our errors, our mistakes and our past and are superficially okay but spiritually broken. Yet it is only until we have hit rock bottom that we cry out for God to help. On the porch, I realized that as people, we fail and we sin, but God repairs and restores. In the same way that my crew removed the porch, God removes our sin. He takes it all away, and like our homeowner, we stand on the sideline weary and torn, because all we see is the destruction of all we've ever known; all that we've ever been. 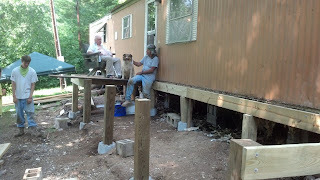 But God is a God of wonders, and in the same way my crew did today, he remakes our foundation so we can stand tall again, he constructs us with pressure treated wood and galvanized nails to prevent us from rotting or rusting. He builds us new, our neglect and sin is forgiven and no longer exists; and though we will sin again; storms and tribulations will com, we will be prepared for it; because through him we are no longer a weak people of sin, but a strong people of God. Here is the porch today. The Crew at this site is a double crew consisting of: Stacy, Blair, Samantha, Lindsey, Brian, Sydney, Rob, Conner B., Zak O., Mickey, John A., Linda O., Linda B., Bill D.
Monday night hangin' on the porch. Our crew "Sundance Bonito" consists of Dan, John O, Taylor, Josh, Emily, Max and me Caleb our job is to reside an old house for this guy named Bruce and his wife Janice. Our awesome crew took on the first day with pride, power, determination and team work. We showed up at the house and instantly got unpacked and to work on the sides of the home. As we worked we joked around and talked to our home owner and got most of the water proof covering stapled to the house. As we worked we had this very cute dog watching us through the windows all day long. 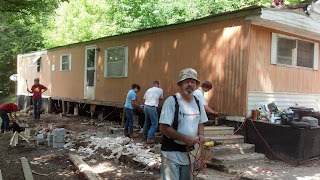 As we worked on the sides we had to move objects like tires and toys and boxes away from the sides of the house. One of my crew members reached for a tire to move it and I noticed that there was a spider on the tire so I said to stop and they asked why and I pointed out that the spider was a black widow. Well that was enough excitement for one day so we moved the tire and the spider away from the site. Our day ended well with most of the water proof covering done and the siding ready to be put up. Our jobs not finished but we did good for today and there is much more excitement to come in the following days. We all can't wait for tomorrows work. "O, Brother" consists of John C., Sue F., Kalyn N., Katy G., Chelsea F., Mike B., and Billy G. Since today was our first day, we weren't sure what to expect. It was a slow start, but everyone quickly changed gears. 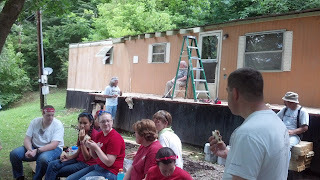 Katy, Kalyn and Billy are in charge of sheet-rocking and spackling one room of the house, while Sue, John, Chelsea and Mike replace the floors in the kitchen. There is a lot to do, but we couldn't be happier to be on ASP again! Our family is two of the nicest ladies. Getting to know them and see how much they appreciate the work that we do is the biggest reason why we choos to come back year after year. Although we suffer through frustratingly crooked rooms, heat and bug bites, we still look forward to going back the following day. Now that we have a plan, we feel confident that we can finish what we set out to do. Even though it is only day one, I can tell we are all in for a great week. We were lucky enough to be given a great center and a kind staff. Our work site has a spectacular view of the mountains, and best of all, an amazing family. The owners, Mary and Joe, built the home themselves and take a lot of pride in it. Still, they welcomed us with open arms and many thanks. Mary is currently suffering from cancer, but her amazing spirit does well to hide it. Whenever we saw her, she would always have a smile on her face and has an amazing talent of making that smile contagious. I am very thankful to have met herr and Joe, and the painted hand-prints of previous ASPers. These along her fence shows her appreciation of their great organization (ASP). While it was plenty hot on the tin roof we're replacing, ASP is one of the coolest things a person can do with their summer. Starting on Wednesday, work crews were allowed to bring cameras out to their worksites. In the next few days we'll gather those photos to offer a view of the work we did and the people we met.